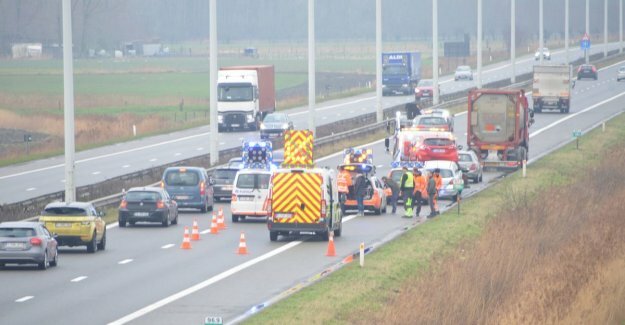 Oudenburg On the A10 motorway in Oudenburg is Tuesday morning an accident occurred involving five cars and a truck were involved. One person was taken to the hospital. The accident happened around 9 p.m. in the direction of Ostend between Jabbeke and the exit Oudenburg. The exact cause is not known. May have slowed down one of the directors quite abruptly with a pile-up as a result. The emergency services were immediately on the spot. One officer walked minor injuries and was taken to the hospital. By the accident, there was immediately a long file. It was whisked away from Loppem on the E40. The vehicles were hoisted. Around 11 hours the discomfort passed.